SolarCulture (a PineGate Renewables project), is an initiative developed to enhance environmental stewardship, promote sustainable agriculture, and collaborate with the community to support research with a goal of encouraging smarter solar through science. They have just recently opened a solar apiary in Jackson County, Oregon. The project is two pronged, it aims to tackle both our fossil fuel dependance as well as our rapidly declining numbers of bees. After examining the site’s seed mix, vegetation management plan, and early growth of native flowers and grasses, John Jacob of Old Sol Apiaries determined the site would offer safe refuge for his 48 hives of honey bees. Data from the UK shows that pollinator-friendly solar arrays result in increased abundance of bees and other insects, which can provide important pollination and pest management services to crops. 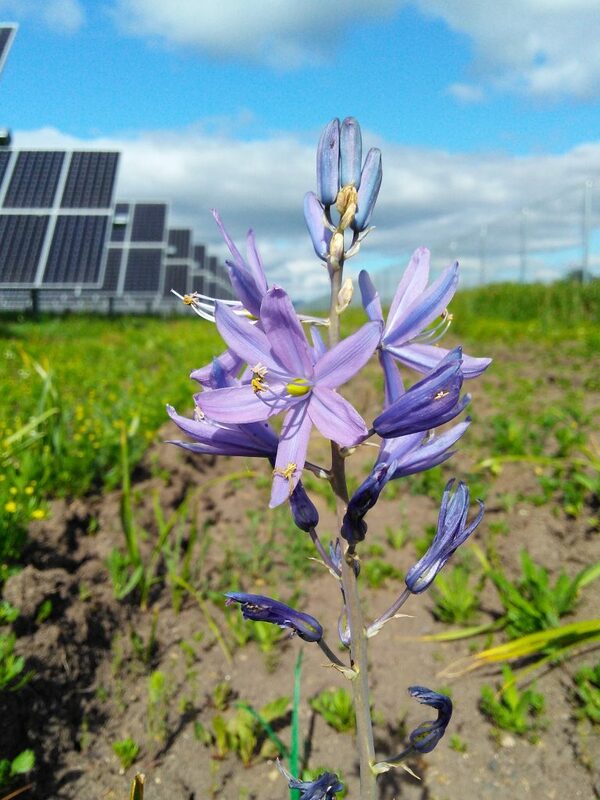 “Examining the Potential for Agricultural Benefits from Pollinator Habitat at Solar Facilities in the United States,” a recent peer-reviewed study published in Environmental Science & Technology, identified more than 16,000 acres of pollinator dependent crops in proximity of 204 megawatts of solar arrays throughout Oregon. Praised by several of the nation’s most prominent entomologists, including MacArthur “Genius” award recipient Dr. Marla Spivak and Presidential Medal of Science recipient Dr. May Berenbaum, pollinator-friendly solar arrays are different than traditional arrays. Pollinator friendly solar sites use low-growing meadows of native flowers and grasses to enrich top soils, capture storm water, and benefit pollinators. All SolarCulture sites meet the specific criteria established by entomologists to qualify as pollinator-friendly. National Renewable Energy Laboratory (NREL), the premier renewable and sustainable energy research lab, is studying pollinator-friendly solar arrays that use low-impact design and engineering methods, like Pine Gate’s SolarCulture sites, in order to be co-located with agricultural functions. The vegetation plan for the project was created by Colorado-based ecological services firm Regenerate, a key partner in Pine Gate’s SolarCulture initiative, and depicts a solar array with native flowering plants and native bunchgrasses throughout the site. By Spring 2019, the 41-acre site is anticipated to provide pollinator habitat equivalent to approximately 24,800 homes planting 6’ x 12’ pollinator gardens, and then maintaining them for 25 years. The Center for Pollinators and Energy at Minnesota-based nonprofit Fresh Energy, tracks information about pollinator-friendly solar and apiaries nationwide. “Old Sol’s apiary at Eagle Point solar is the largest solar farm apiary in America,” said Rob Davis, who leads the Center. conditions are continuously assessed to identify areas of native vegetation successes or failures, and strategies altered based on those observations. “We’re thrilled to see the adaptive management approach recommended by Regenerate, and put into practice by Lomakatsi Restoration Project, showing benefits to pollinator habitat so quickly after beginning the SolarCulture initiative onsite,” says Pine Gate Environmental Manager Julianne Wooten.